It was a big day for SJ Wolfe Racing with 16 entrants engaged throughout the seven-race program at the first Albany Racing Club meeting of the season this afternoon. Progressive three-year-old Triggerfish backed up his solid first-up victory at Mt Barker on November 4, with a convincing come from behind win in the Trevors Carpets Handicap (Race 2-1230m), opening the winning account on the day for the stable. The son of Bullet Train was ideally positioned in the second half of the seven-horse field, before jockey Peter Hall hoisted him to the outside where he unleashed a powerful finishing burst to defeat stablemate Round The Point and record a strong victory. Triggerfish was taking on the older horses today and he is developing into a promising three-year-old for the future. The second leg of the winning double came up in Race 5 on the program, when stable newcomer Wild Fusion (pictured) proved too classy for rivals to win the Furphy Handicap (Race 5-1450m) with stable jockey Shaun McGruddy on board. 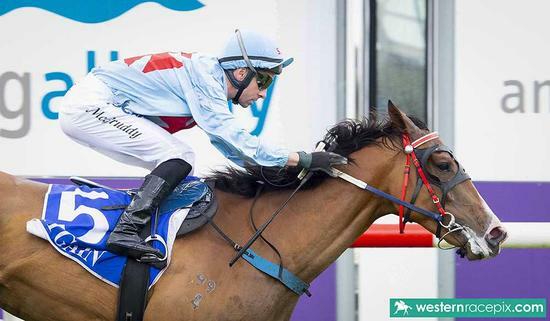 It was the second start for Wild Fusion since joining Team Wolfe and after a perfect ride from McGruddy, he was never going to lose once he struck the front inside the 150-metre mark. Overall it was a handy day for the stable, with two winners and six seconds, and we look forward to another successful day on our home track when racing next returns to Albany's Percy Spencer Racecourse on Friday November 30.